A small family-owned shop, we have over 70 years of combined automotive experience! From classic Volkswagens, to performance vehicles, to car audio and technology, each member of the H&M team has their own area of expertise that we utilize to give you the best service possible. The “M” in H&M Motorworks, Mark began working in the automotive industry in the 1970s with his father Henry at their Standard Oil station at 16th Street and Indian School Road. 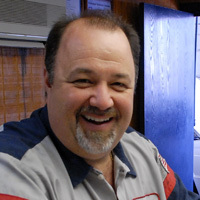 Mark has enjoyed cars ever since he was in his teens, from customizing and restoring cars to racing dirt bikes. Quality-trained and well-experienced, there aren’t many automotive problems that Mark hasn’t seen before or can’t figure out. Always willing to help his customers, Mark enjoys being the face of H&M Motorworks, and wouldn’t want it any other way.